(CNN) - Former Florida Gov. Jeb Bush, whose endorsement has been highly-sought during the 2012 GOP primary contests, announced Wednesday he was backing presidential candidate Mitt Romney. In a statement, Bush congratulated Romney on his win in Illinois's primary, held Tuesday, and said it was "time for Republicans to unite behind Governor Romney." "I am endorsing Mitt Romney for our Party¹s nomination," Bush wrote. "We face huge challenges, and we need a leader who understands the economy, recognizes more government regulation is not the answer, believes in entrepreneurial capitalism and works to ensure that all Americans have the opportunity to succeed." Romney campaign senior adviser Eric Fehrnstrom said Bush called Romney Wednesday morning to alert him of his endorsement. In a statement, Romney praised Bush as a unifying force. 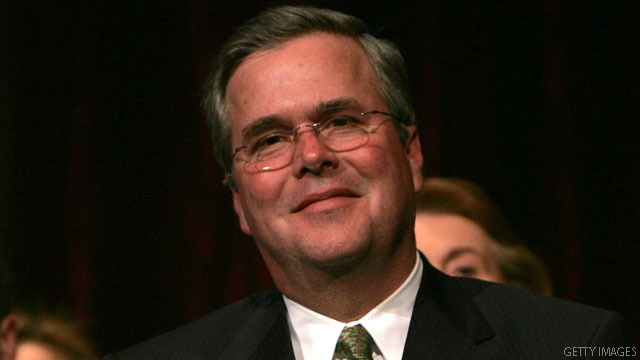 "Jeb Bush is synonymous with good government and with conservative policies that yield results," Romney said. "He has long demonstrated an outstanding ability to bring people together. I therefore take tremendous pride in having earned his endorsement. This is a key moment in the presidential contest and Jeb’s counsel and support will be critical in the coming months in my effort to defeat Barack Obama and turn around our country." Bush served as Florida's governor from 1999-2007, and is the son of former President George H.W. Bush. His brother is former President George W. Bush. Jeb Bush was considered a favorite to jump into the 2012 GOP contest, but stated firmly in May 2011 he would not be a candidate for his party's presidential nomination. Bush declined to endorse a candidate ahead of Florida's January 31 primary, saying he wanted to allow a candidate to "earn" his victory in the state. In January, Bush told CNN Chief National Correspondent John King about the challenges Romney faced ahead of the Sunshine State's contest, suggesting the former Massachusetts governor needed to connect more personally with voters. "His challenge is also to show his heart," Bush said of Romney "He has a great record, and he's been a successful man in every way, and I think people can relate to that if he expresses himself in the right way." George H.W. Bush and his wife, former first lady Barbara Bush, publicly backed Romney in December, and Barbara Bush recorded robo-calls for the candidate that ran in Ohio ahead of the state's Super Tuesday contest. George W. Bush has not yet endorsed a candidate for the 2012 GOP nomination. Responding to news of Jeb Bush's endorsement of Romney, a spokesman for rival candidate Newt Gingrich said "It's a completion of the establishment trifecta." R.C. Hammond was referring to Romney endorsements from George H.W. Bush, former Kansas senator and presidential candidate Bob Dole, and Jeb Bush. CNN's Chris Welch and Peter Hamby contributed to this report. Awesome. Same guy that endorsed Florida's "Stand your ground" law. Florida has nothing to be proud of with respect to Jeb. Any Bush endorsement would have to be laughed at at this point.